I wish I could spend all day here today. Or maybe just the morning, and then I could putter away the afternoon outside in my greenhouse. Sadly, I have an absolute mountain of work. And another batch of pâte brisée to make. It wouldn't be entirely untrue, in fact, to blame the short crust dough for the situation my procrastination has put me in. The first time I made it, late the other afternoon, I spent at least two hours thinking up fillings for dinner and dessert. Eggs or rhubarb? Onions or blueberry jam? I thought at one point we might have to try and fit both savory and sweet into one tart pan: a half quiche half pie sort of deal. Thankfully, I realized we had a quart of ice cream in the freezer, so it never came down to that. The thing is, the French know what they're doing when it comes to tarts. They mix and match all sorts of fillings with the same, simple crust, which on the one hand makes deciding what to put inside any given tart a Herculean task, but on the other hand, makes for quite a handy go-to dough. Pâte brisée makes for an excellent container, no matter what you want to put inside. I can't decide for you what you ought to have for dinner tonight, but I can say this: It should involve a batch of short crust dough. Whatever you have on hand, I think you'll find it fits. Preheat the oven to 400 degrees F. In a medium-size mixing bowl, whisk together flour and salt. 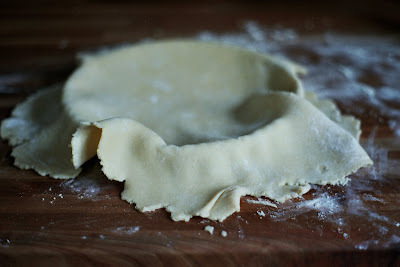 Work in butter using a pastry cutter until it is in pieces the size of peas. Add water, and work the dough into a ball using your hands. Roll the dough out on a floured surface until it is about 13 inches in diameter. 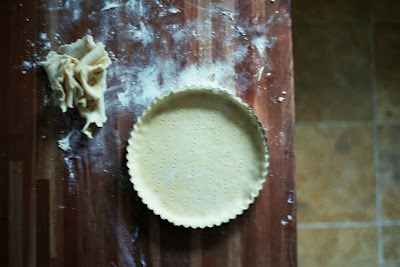 Line a 10-inch tart pan with the dough, trimming the excess and pricking the bottom with a fork. Line the dough with a sheet of aluminum foil and fill it with any variety of dry beans. (These beans and the fork pricks will allow you to pre-bake the crust without the dough puffing up, so that you can add the filling later.) Bake for 15 minutes; remove foil and beans and bake for another 5 minutes. Remove from oven; you now have a partially pre-baked tart shell, ready to fill. Elspeth, it just so happens I was filling a homemade pie crust myself tonight, so I have a suggestion for anyone wondering what to put into their pate brise: ratatouille pie, of course! I made several batches of ratatouille last summer and froze them in 2-cup portions. I like to cook about 5-6 slices of good bacon and crumble these onto the bottom of my pie crust. Next goes some nice grated cheese -- maybe 1/2 cup or so (I don't like to stint on cheese!). Then on goes the ratatouille, thawed from the freezer. And on top of all that goes 4 eggs beaten w/ 2 Tablespoons milk. A sprinkle of paprika adds a nice touch. Bake at 375 for about 30-40 minutes. This is equally delicious hot out of the oven or served cold for lunch the next day. Me too! I will have to put ratatouille on my freezer list this summer...it is so good.